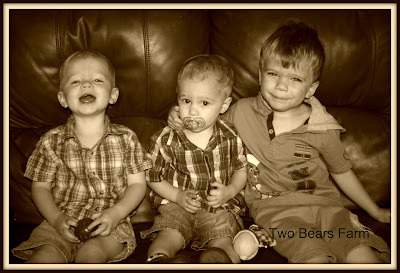 Two Bears Farm and the Three Cubs: Hello? Poison Control? It's Me, Lisa. Again. Hello? Poison Control? It's Me, Lisa. Again. We consider our house pretty child proof. We've got gates up over the stairs, our cleaning supplies are protected by child locks, and we keep the bathroom door shut. Our outlets have covers, and there is a lock on the pantry. The thing is, you just never know what kids will get into. And we have one that is very sneaky and very fast. Can you guess which one of these jokers is giving us trouble? If you guessed Reid (far left) you'd be right. It started with the changing table. Reid is tall, and one day he pulled the A+D ointment off the changing table. I found him sucking it down like those squeezable yogurts. Nice. None of the ingredients were too alarming (castor oil and the like) but it did say to call poison control if ingested. So I did. They warned that it might cause loose stools if he ate a good amount. I countered that at least he'd be well-lubed for the cause. No harm done, and I moved the ointment. Not even a month later we had another incident. Paul was in the bathroom with Cort and Reid. He was brushing Cort's teeth, and Reid was looking for trouble waiting his turn. I was putting away cloth diapers and walked out in the hall to see Reid chugging tea tree oil with a dreadful expression on his face. The tea tree oil is kept in the bathroom (I use it on occasion to strip the cloth diapers), so it never occurred to me that anyone would get it. But Reid is fast. In a split second he'd snagged it, run out in the hall, unscrewed the top, and taken a swig - all while Paul was brushing Cort's teeth. I promptly removed the bottle, but a whiff of Reid's breath almost knocked me over. Yes, he definitely sampled it. But how much? I had to call poison control again. This time was a little more serious. It was bedtime, but we had to keep Reid up for observation for an hour. If he started vomiting or became extremely drowsy, we were to take him to the hospital. He was also supposed to eat and drink something. Oh, Reid had a grand old time staying up late without his brothers. He gorged himself on squash bread and ran giddily all over the house. Thankfully, he was fine. I hope I don't have to call a third time. Because I'm pretty sure if they see just one more call from my number alarms will go off in the building and I'll be declared an unfit mother. At any rate, moms, have the number on your fridge or programed in your phone - someplace you can find it easy. Because it only takes a split second for kids to grab something they shouldn't, no matter how child-proof you think you are! We are so thankful our sweet (but sneaky) Reid was okay. I have a giveaway celebrating 400 followers here for fun beauty supplies, come enter! And for a wonderful yellow squash recipe, check out my Tex-Mex Squash Casserole, which is featured in a guest post on Recipe Lion. It was a huge hit with the whole family! Lisa, I'm afraid your poor child is growing up to be...me. I've called poison control several times for myself. Nail polish remover bottle dropped and it splashed into my mouth. Mixing gas and oil for the chainsaw and the lid flew off..of course it splashed across my face and INTO my mouth. Oh my,that gets a little scary! No one with kids of their own would think you an unfit mom! It is hard work keeping them safe 24/7! And well,kids are mischievous ! Oh, my goodness! He keeps you on your toes! I'm glad he's okay, despite ingesting non-foods! Every family has to have at least one little dare devil. Sounds like Reid is yours. I can't tell you how many times I've had to call poison control raising my 4 children. Sometimes you wonder how they ever make it to adulthood. I'm so glad he's OK. This sounds scary! I don't know if I could speak clearly on an emergency call. I had to call poison control twice when Amy was little-once for getting into my vitamins and the other for eating some strange berries off of a bush at a friend's house-berries that no one could identify. I had that same thought-that if I called again they'd come after me for being an unfit mother! I'm glad Reid was ok both times. It's frightening when kids do stuff like that!! I'm glad everything turned out ok. This is such a great reminder. Kids are quick. Another thing I'd like to add is to make sure anytime your kids spend time out of the home (like the grandparents) that they need to child proof and have the number too. We've had some near misses like this. I am back from a week long family vacation so sorry I haven't written more. This story is precious - make a hard copy and put it in a book for them to read someday. Great story and I am so glad Reid is okay! Wow - I'm sure those were two scary situations. Glad you had the poison control number handy! glad it has worked out ok for you! I'm glad to hear he is ok! That type of thing is so scary. They are just so sneaky. Scary stories!!! My niece's baby ate toothpaste, and even a pea sized dollop is poison to a baby, he was kept at the hospital! And when my son was little, he got into the 3 in 1 oil. That was when he was being babysat at his grandmother's house. OMG, you do have your hands full! Glad it turned out all right! Mama's got an exciting life ahead of her that's for sure! I caught up on a few of your posts and am amazed at all that you can accomplish with 3 boys! The pickles look amazing, we are still waiting for mature cukes up here! I love it! It is so great reading about other peoples twins, especially ones close to my boys age. Double the trouble, Double the joy! I am your newest follower! I don't have children, but as my parents got older, I had similar problems with them. It's not easy, is it? Thanks for the squash recipe! Oh man! How could a person not throw up after tea tree oil? As a mother of twins, I know exactly how hard they are to keep up with (or were at that age) and mine are GIRLS! I think some kids are just born more mischievous. :) I'm glad I'm not the only one who's had to call poison control. Scratch that. I'm not glad you had to call, I can just relate. We've had a gummy bear vitamin overdose and the same daughter decided to sample some zofran. She still survives. I think I would have guessed him...he just has that look about him! Imagine, chugging the tea tree oil! My goodness! My middle took the cap off the gas tank on our ATV and was inhaling deeply one day when he was 3. Imagine giving the "no huffing" lecture to a toddler. I hadn't prepared myself for that! Oh my gosh he is a sneaky one isn't he! Thankfully I've only had to call once. My youngest grabbed the cleaner that you use when you get your ears newly peirced. She somehow managed to unscrew the lid & dump it on her face & got a little in her mouth. I was mostly concerned about her eyes. THANKFULLY it ended up not being that big of a deal but the poision control made me call them back every hour for 4 hours monitoring. I felt like the worsst mama. OH, those little ones manage to get into everything, don't they!! Glad your little fellow was OK. It sounds like it's time to "baby proof" a bit more. I know it's frustrating not to have things handy when you need them, but if it keeps the little people safe, then it's worth it. I work with young children and we have to keep everything up out of reach, 5 feet up or higher. But even that won't keep a "climber" out of things... We moms really need those eyes in the back of our heads! What a little stinker! I've never had to call, but I do have the number programmed in my phone! LOL .. they're just getting started. Don't feel too bad, they all do it, even the girls. My daughter was worse than my son early on; he saved all his "sampling" for puberty. Maybe he'll get it out of his system. I used to set up a motion alarm to tell me when the daughter had snuck out of her room at night to get into stuff. She was about 4 / 5. She figured out how to plug and unplug a radio in her room on a certain switch that would blow the circuit that the alarm was plugged into. So you see, it doesn't matter what you do .. only that you try.